A dynamic new story about how babies make their way in the world—and how grown-ups have tried to make sense of these tiny inscrutable beings. As a new parent, Nicholas Day—that's me—had some basic but confounding questions: Why does my son find the straitjacket of his swaddling blanket comforting and not terrifying? How can he never meet a developmental norm and still be OK? And when will he stop sucking my finger? So he went digging for answers. They were not what he expected. Drawing on a wealth of perspectives—scientific, historical, cross-cultural, personal—Baby Meets World is organized around the mundane activities that dominate the life of an infant: sucking, smiling, touching, toddling. From these everyday activities, Day weaves together an account that is anything but ordinary: a fresh, surprising story, both weird and wondrous, about our first experience of the world. Part hidden history of parenthood, part secret lives of babies, Baby Meets World steps back from the moment-to-moment chaos of babydom. It allows readers to see infancy anew in all its strangeness and splendor. Read an excerpt from the introduction here. Nicholas Day has birthed a perfect book: expertly researched, beautifully written, wise, warm, honest, funny. What makes it fascinating is the same thing that makes it reassuring: When it comes to caring for babies, there has never been one right way to do it, but dozens—contradictory, bizarre (goat wet nurses! ), hilarious in retrospect but always well-meant. If you have a baby, expect a baby, were or still are a baby, this is a book for you. In Baby Meets World, Nicholas Day brings us the book about infants that parents should have had all along: smart, funny, and tender, with just the right amount of edge. 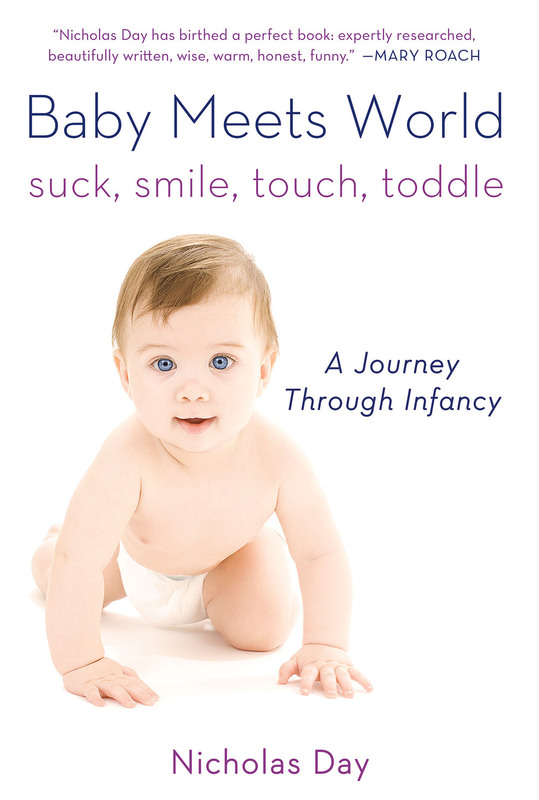 Engaging and enlightening, it belongs in the diaper bag of every new mom and dad. Read more nice things people have said here. Many books about infant development are instruction manuals for parents. This book is the opposite: It tells readers how infants develop, or how we now think they develop, while showing how models for good parenting have varied wildly over the years, even within the recent past. Instead of offering advice, Baby Meets World highlights how numerous convictions about infants held by experts and parents have turned out to be misguided, comic, harmful, or just really, really weird. By telling these stories from the back pages of parenting, the book fosters some healthy skepticism about childrearing advice. And by illustrating the many different ways babies have been and are raised, it will make clear that there’s no single right way of doing things. It’ll allow readers some breathing room. It is amazing how susceptible you are, as a new parent, to what other people have said about babies—and what they have said about how you, the new parent, should behave. When I was writing about the science of touch in infancy—even when I was writing about half-baked beliefs about touch in infancy—I found it almost impossible to be away from my child. Even when you don't believe what people are telling you, it sinks in. That's the plight of the new parent. Think of Baby Meets World as a crude lifeline, something to pull you out of the quicksand.